Homeowners often use glass tiles because of their dramatic appearance. They are easy to clean and maintain. Glass tiles also will not discolor, unlike other traditional tiling. 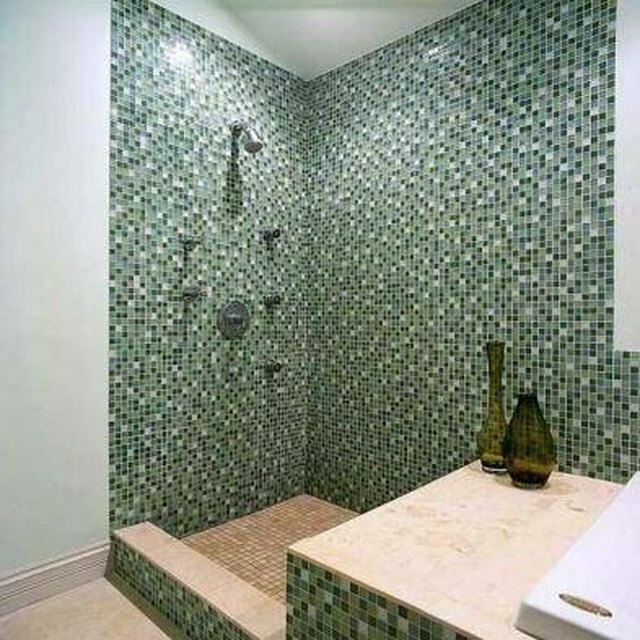 "Epoxy grouts are becoming popular for use with glass tile because of their longevity, strength and relationship with the glass," according to BobVila.com. Such epoxy grouts as SpectraLOCK and Kerapoxy resist mold, discoloration and are less prone to breakdown. You can choose a grout color that enhances the appearance of your tiles and grout the glass tiles yourself. Wait a minimum of 24 hours after affixing your glass tiles before grouting them. Tiles should be clean and dry and free from any dirt, grease or residue before you apply the grout. Mix your epoxy grout according to the manufacturer's instructions. This usually includes pouring the hardener and resin into a clean bucket and mixing with a drill at a slow speed of 200 to 250 rpm. Finish stirring the mixture with a mortar stir stick. Add the filler to the bucket and mix for an additional two minutes until the mixture is an even color. Apply the grout using your grout float in an upward diagonal motion to the surface of the tiles. Spread the grout back and forth until you have completely filled the gaps. Use the grout float to remove excess grout. Wipe the the tiles with a dry cheesecloth. Use a well-wrung, damp sponge to smooth and remove any remaining grout from the tiles. Remove as much of the excess as possible, but do not saturate the tiles or scrub them excessively. Wait 48 hours after completing the grouting process to remove any hazing. Clean the grout joints and tile with a nylon pad or brush to remove remaining residue. Rinse the tiles with warm water. Use a four-to-one warm water and vinegar mix to remove additional residue, if needed. Allow the area to air dry. Glass tile grout takes longer to set than normal tiling. You do not need to seal glass tiles, but you may seal the grout, if desired. Do not get sealant on the tiles as this will result in a hazy appearance. Never use acid-based cleaners to remove grout haze from tiles.